The Mayor's Alliance for NYC's Animals offers low-cost microchipping clinics in New York City, where your pet can receive this simple, potentially lifesaving service for only $25. When finances are tight, it's easy to become overwhelmed and think that the only thing you can do is to surrender your pets to a shelter. Fortunately, New York City has several programs in place to help struggling pet owners continue to provide their furry family members with veterinary care, food, and other necessities. If you need financial assistance to help pay for veterinary care for your companion animals, there are programs available that can make routine care or emergency treatment more affordable. Spaying or neutering helps your pet live a longer, healthier life, saves you money, and fights pet overpopulation and euthanasia. These free or low-cost clinics and programs can make this important surgery more affordable. The Mayor's Alliance for NYC's Animals holds low-cost microchipping clinics at events throughout the year where you can have your dog(s) or cat(s) microchipped for only $25 each. 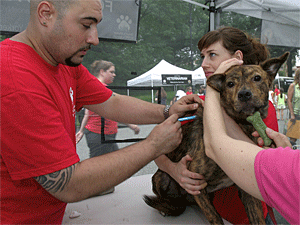 Other organizations also sponsor microchipping clinics in the New York City area. If you need a little help affording food and supplies for your pets, these programs can help.